Sharply attacking the Congress and the BJP for being in collusion to defeat the Jan Lokpal Bill, Arvind Kejriwal, who resigned as the Delhi chief minister, on Friday evening said that people will teach both the parties a lesson in future. "They tell lie that we are not following Constitution. They want to do corruption. Both BJP and Congress have joined hands. We say eradicate corruption. They say it is unconstitutional. They break mikes and consider it as Constitutional. People will teach them a lesson," he told a large gathering of his supporters outside Aam Aadmi Party headquarters. "I was disheartened with what happened in the Assembly yesterday. They wanted us to work as per their wishes. They thought we were new and would ask for their advice in every work we do. But we followed the Constitution and I am ready to sacrifice my life for the Constitution," said Kejriwal. "I remember, we were here when Delhi Assembly elections were announced. I remember addressing you from this window. We got 28 seats and we were not sure of making government. We had vowed that we will not take support of either BJP or the Congress. "Congress forcefully supported us. We asked the people. They told us to take the support for as many days as possible and deliver the good work," he said. Following which, we came to power on December 28. Our biggest promise was to pass the Jan Lokpal Bill, a strong anti-corruption Bill. Congress had given in writing that they would support the Jan Lokpal Bill, he said. "When today we tried to introduce the Jan Lokpal Bill in the Assembly. BJP and Congress came together. It has never happened before... They defeated the Jan Lokpal Bill. 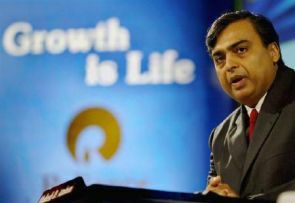 Why that happened, because three days ago, we had filed an FIR against Mukesh Ambani (RIL chairman). He is the man who runs this country's government," Kejriwal claimed. "Mukesh Ambani had once said that Congress is his shop and he can buy anything from them and since the last ten years he was running the UPA government, Kejriwal alleged. "Mukesh Ambani is behind Modi also. From where does Modi get so much money? Modi moves in helicopters. From where does he get money to conduct such huge rallies? When we raised fingers against Mukesh Ambani, Congress and BJP joined hands," he said. "They thought that Kejriwal has a small anti-corruption branch and is creating such a nuisance. If Jan Lokpal comes, half of their partymen would go to jail. They thought that we would also raise voice against Sharad Pawar, Kamal Nath," said Kejriwal. He said both BJP and Congress meet everyday behind curtains to loot the country. "But in the last few days. Their real faces have been exposed. Both of them today did not allow the Bill to be passed in the Assembly," he said. Both BJP and Congress could not conduct audit of power distribution companies in last five years. We did it in five days. They could not reduce corruption in 65 years, we filed FIRs against corruption done by Sheila Dikshit, Kejriwal said. "They told us not to do this and do governance. Is governance not about sending the corrupt to jail?," he asked. Kejriwal said: "I am no one. I am one among you. I have not come here for position. Today as Jan Lokpal Bill could not be passed our government resigned. Our cabinet has recommended that the Delhi Assembly should be dissolved and fresh polls be conducted. "If I have to resign 100 times from the post of Chief Minister, I will...At last I will pray to God that we are small people. Please give us good thought so that we can sacrifice our lives for the good of the country," Kejriwal said amidst applause from his supporters.